John Addison's father and grandfather both served in the British armed forces, and Addison himself had to interrupt his music education to enlist at the start of World War II. That musical education started at the age of 16 at the Royal College of Music, where he studied composition, oboe and clarinet. Addison joined the army in 1939 and served until the war ended in 1945, and was also wounded while in Normandy. One wonders if his military experience contributed in any way to his music compositions, particularly the war films which he later scored including "Reach for the Sky", "I Was Monty's Double" and "A Bridge Too Far". Douglas Bader, the war hero whose story was dramatised in "Reach for the Sky", was actually the composer's brother-in-law since Bader married John Addison's sister! After the war he returned to his music career initially teaching composition at the Royal College of Music, though he was soon involved in creating music for the media. Many of his early films were productions for the Boulting brothers, and interestingly one of those "Seven Days to Noon" (1950) was actually co-written by James Bernard who then went on to become a composer in his own right focussing on the horror genre. 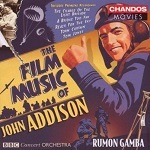 Although Addison also composed classical works for the concert hall and the theatre, it is certainly his film music for which he is best remembered. Although there are some war films among his output, there is considerable variety across the films that he scored. There were thrillers, comedies, historical dramas, detective mysteries, action movies and even science fiction. It seems he could really bring any genre of film to live. In 1963 he won an oscar for his score to "Tom Jones" starring Albert Finney in the title role in the adaption of Henry Fielding's novel. However Addison was not present at the awards ceremony and fellow composer Elmer Bernstein accepted the award on his behalf. 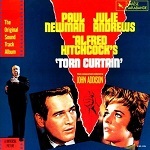 When Alfred Hitchcock fell out with his usual composer partner Bernard Herrmann, Addison was asked to step in and provide music for "Torn Curtain" the 1966 thriller with Paul Newman and Julie Andrews. 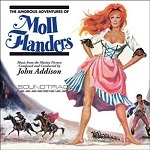 Addison also had occasion to compose both score and songs for George Melly's musical satire "Smashing Time" (1967). 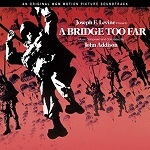 Addison was oscar nominated for "Sleuth" (starring Laurence Olivier and Michael Caine) in 1971, and in 1977 he won a BAFTA award for "A Bridge Too Far". Shortly after this Addison moved to the US where he settled in Vermont. Much of his later work in the 1980s and 1990s was therefore for US productions including a couple of movies but mostly TV work starting with the likes of mini-series "Pearl", "Centennial" and "The Eddie Capra Mysteries". It was while in the US that he wrote his most widely recognised music with the theme for the long-running series "Murder, She Wrote" starring Angela Lansbury. Reach for the Sky - starring Kenneth More as the war hero pilot Douglas Bader, who continued to fly after losing both his legs and who also happened to be the composer's brother-in-law! 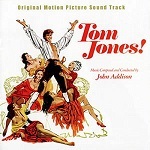 I Was Monty's Double - starring John Mills as Montgomery's double, the movie is also called "Hell, Heaven or Hoboken"
Moll Flanders - aka "The Amorous Adventures of Moll Flanders"
Among his Television music, the most recognisable is probably the theme from the series "Murder She Wrote" which starred Angela Lansbury.